I’m not in the habit of reviewing books, but I have a special interest in this one, not merely because I played a role in its production, but because of what the book means to us culturally and economically. What follows is the review I posted on Amazon. I have long been enamored of the concept of Systems Thinking, which holds (among other things) that systems cannot be understood absent their context, the interrelationships of components within each system and with other systems of which they are a part (or are a part of them). In my career I have often heard it said “context is king.” I am predisposed to look for the contextual interrelationships in all things I attempt to understand. It was nearly a year ago when Shel Israel posted a request for help on Facebook. He was looking for people who could serve as fact-checkers for his and Robert Scoble‘s new book. At the time, I responded and suggested I could serve as his proofreader. He accepted. Thus began a wonderful adventure. Soon I was proofing Shel’s columns in Forbes (q.v.) under the general title “The Social Beat”. Most of them were portions of what would become the chapters of this book “Age of Context”. Since that time, I have proofed nearly every column he’s written related to the book, as well as each chapter that ultimately became this wonderful book. I also outlined at least six of the chapters for the authors to use in interviews and at speaking engagements and, toward the end, ended up checking each hyperlink and compiling them into a single document. I bring all this up in part to reveal what surely has the appearance of a conflict of interest in my recommending you purchase and read this book. However, the greater part of what I’m revealing is how thoroughly it moved and excited me. I will admit to being a techno-geek, and I am naturally drawn to shiny new things. I am somewhat prejudiced. 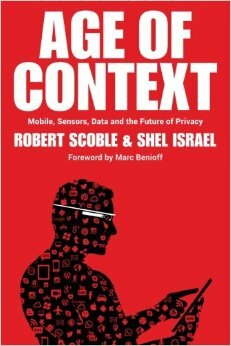 However, Robert and Shel have carefully scoured the tech world and now present their findings and conclusions, and many of them should fairly knock your socks off. I can’t tell you how many times I practically came out of my seat as I was reading about their discoveries. It made it hard at times to do my job. Frequently, I wanted to add my own comments to what they were explaining. I somehow managed to contain my excitement. It’s their book, after all. In “Age of Context” you will find dozens and dozens of applications and approaches that seek to more completely understand, and integrate into, various aspects of our lives. Whether in the home, at work, or at play; whether in their approach to health, recreation, designing and building cities, or marketing product intelligently, Robert and Shel bring together (put into context, if you will) what these developments mean and how they can — and most likely will — improve our lives. They also recognize, and in no way gloss over, the important issues of privacy and safety many of these developments raise. Yes, I am somewhat prejudiced. However, I feel quite safe in saying this is an important book. I don’t care for the term “futurist”, but I’d like to think I can recognize some of the next big things. There are a lot of them in this book. You owe it to yourself to understand the coming storm of innovation and change the authors so presciently offer.